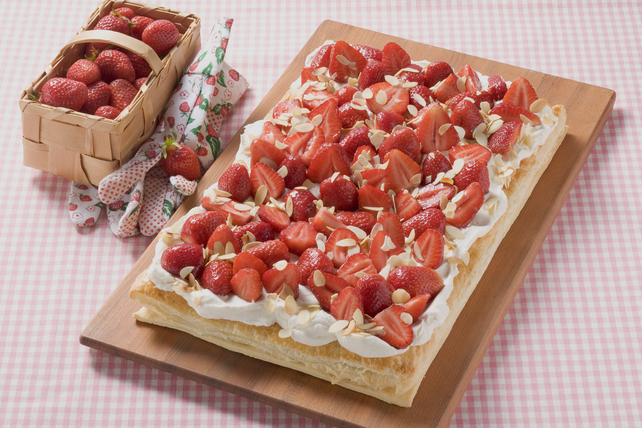 This impressive baked tart features sliced fresh strawberries nestled in a creamy filling on a sheet of golden puff pastry. And as a bonus, it's as delicious as it is easy to make. Roll out pastry on lightly floured surface to 11-inch square; place on baking sheet. Fold over edges of pastry to form 1/2-inch rim. Prick pastry sheet with fork. Bake 10 to 15 min. or until pastry is puffed and golden brown. Cool completely. Place pastry crust on serving tray. Beat pudding mix and milk in large bowl with whisk 2 min. Stir in Cool Whip; spread onto crust. Top with strawberries and nuts. This impressive dessert can be prepared in advance. Refrigerate up to 4 hours before serving.